The semi-finals of the European focused Startup 2.0 contest were held in Madrid on the weekend, an event with 15 of the best/ most promising Web 2.0 startups out of an initial 300 nominees presenting. 5 startups were chosen as finalists with the final to be held in 2 weeks time. Amongst the final five was 5min, billed as a “Life Videopedia”. We’ve covered similar start ups previously, most recently SuTree, which like 5min hails from Israel. English company VideoJug also operates in the space and took $30 million in funding last week. 5min sits between the two in terms of function. SuTree is an index of external how-to content, VideoJug creates their own how-to content. 5min is more like YouTube, content is hosted on the site and is user submitted. 5min have created a video system specifically for instructional content. 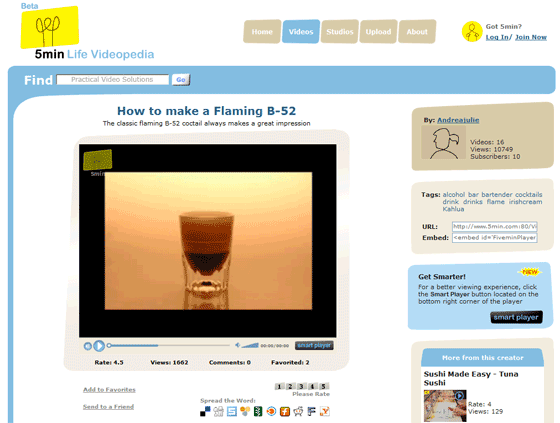 Video creators can add a storyboard to uploaded videos to help others better understand the content. The need to focus on particular skills in uploaded videos has not been forgotten. Video on 5min can be played in slow motion or frame by frame, and the inline player supports zooming in and out for a more up close experience. Given the interest and money in this particular niche there’s definitely something in the water. 5min presents a familiar setup to any person who has used YouTube style video sites whilst applying a number of unique features that are sure to win the hearts and minds of the DIY minion army.